I believe some of my readers like to do cross stitch. If so, speak up! 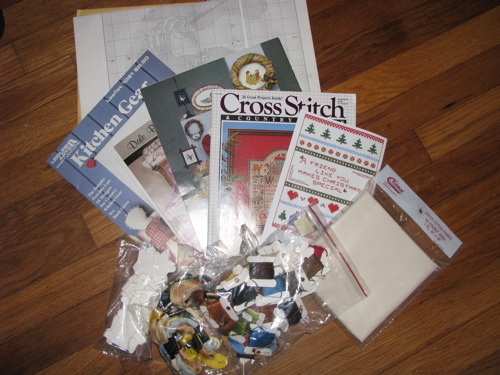 I received this lot of cross stitch books, a nice assortment of DMC floss, floss keeper cards and Aida fabric from a neighbor. I haven’t done cross stitch in a long time so I’d like to give this away to someone who will use it. I can’t think of anyone locally so I thought I’d post here. 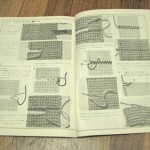 I can include an embroidery hoop for an interested beginner. The chart in the back is for a unicorn. I had to smile remembering how popular unicorns were with us girls when I was in junior high. And if there is further interest, I have a few original charted designs that I can share by PDF. ETA: Thank you friends. These are spoken for and I will contact recipients for addresses. After eight days the fever finally petered out. We had to reschedule the boy’s party but we did have cake and presents after turkey dinner. 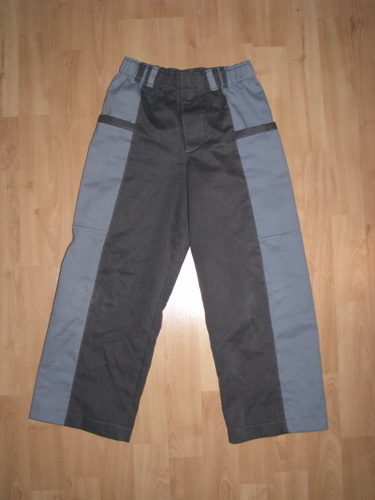 I didn’t get nearly as much done as I had hoped but I did manage these pants. Based on the same basic pattern as these brown pants and using the same soft brushed twill in grey and river blue. The deep pockets built into the full length side panels received the ultimate praise from the boy – “awesome”. 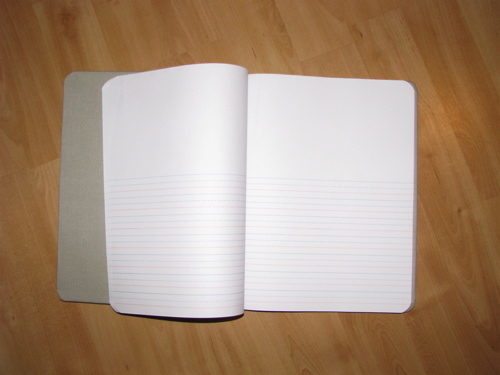 I also found this neat composition book with pages that are half blank and half lined. I sewed a cover for it with a pencil pocket and used a fabric marker to personalize it. Still a bit plain but already in use. 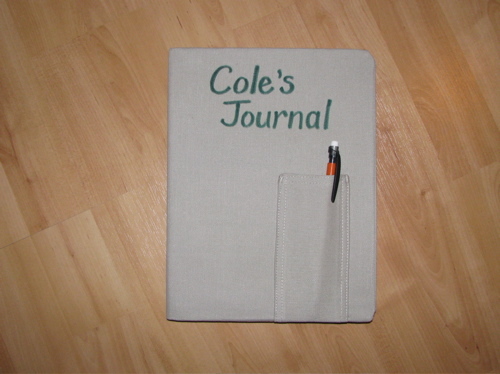 Maybe I’ll suggest he doodle on the cover with fabric markers. We went to see my parents last weekend and my mother gifted me with several odd contraptions and a book I can’t read. Ha ha! 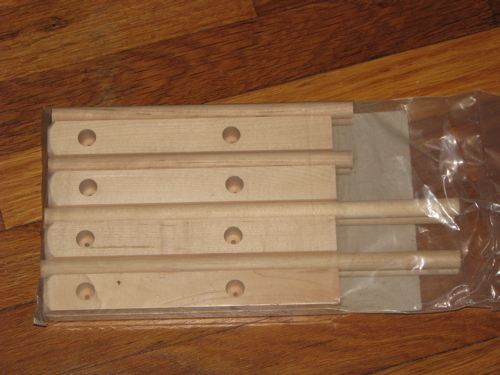 This one is a yarn swift which is used for winding yarn into hanks or skeins. It folds up like an umbrella into that cute pink box. This one is a ball winder which will wind yarn from skeins into center pull balls. 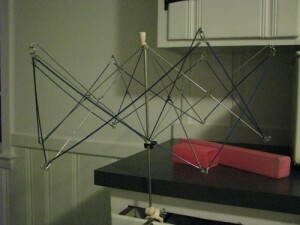 I remember helping my mother wind yarn with this when I was a kid. You’ll see I immediately put it to good use. 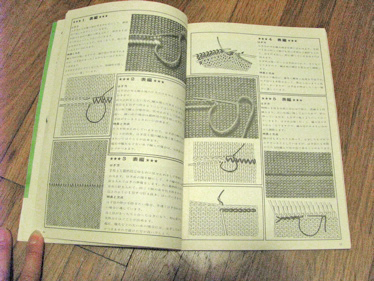 And this book about how to make seams in knit and crochet pieces. 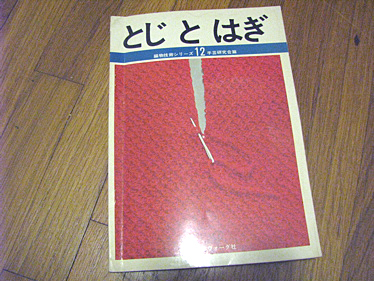 Really amazing, all in Japanese but with great pictures and illustrations of each technique. 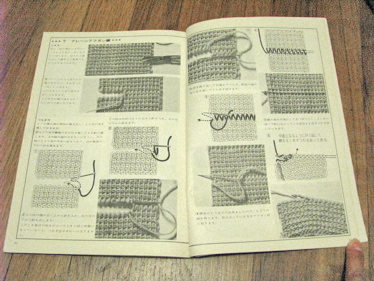 There are some incredible pictures of invisible seams in what seems like pretty complicated knitted pieces. These will come in handy for my spinning and knitting projects. First off I have been wanting a copy of any Mary Brooks Pickens sewing book and I scored this 1953 edition off eBay for less than $10. The outside looks its age but the inside is totally clean! 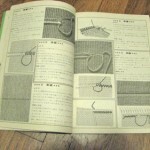 It’s full of all sorts of great knitpicky sewing details that you can’t find in modern books. 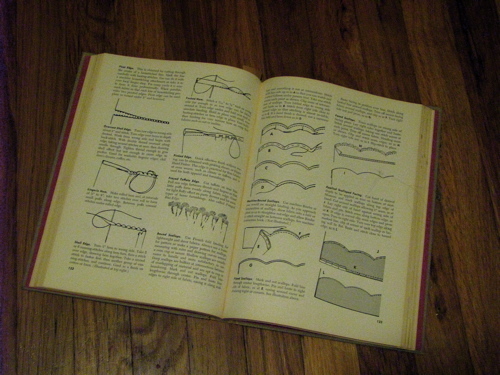 Now if I can just find a 40’s/50’s vintage pattern drafting book I’ll be all set! 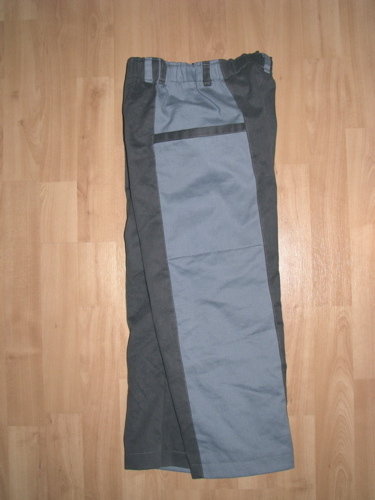 I think there was also some household shopping in there which involved a new watchband for me—exactly like my old watchband—just not falling off the pins, a very stylish linen shirt for DH, a bargain pair of pink-trimmed sneakers for the girl and a few pairs of much needed jeans for the boy. Yes, I broke down and bought them. I promise to still finish the scary pair. But the highlight of my weekend was a visit to Spunky Eclectic. 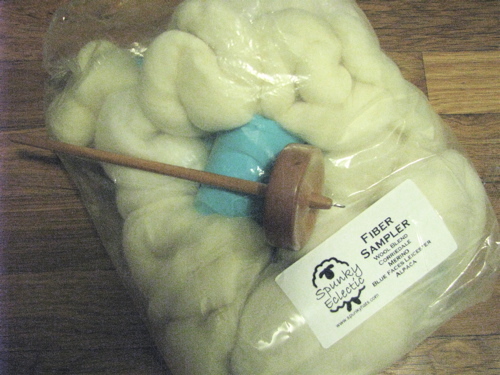 I’ve been searching for a local yarn shop that also carried fiber and spinning wheels/spindles. I had found a few but was kind of intimidated out of actually going for one reason or another. Then I found Spunky Eclectic’s site which just seemed so much more inviting, and not any farther away so I decided I had to go! The shop was full of all sorts of beautiful hand dyed fibers and yarns and so many textures to feel that I’d only had names and word descriptions of previously. And the proprietress, Amy, was so nice, showing me around and answering all my questions, I’m afraid I talked her ear off! I went to buy sock yarn and look at wheels and spindles and fiber. There was just too much to take in, I’ll have to go again of course. But I came home with a Cascade spindle and a sampler of different wools to try spinning. It was really interesting to feel the subtle differences. I didn’t know which to start with. I thought about dyeing them but I don’t have any acid dyes besides Kool-aid and I’m not really thrilled with the idea of citrus colored socks that need to be handwashed . . . so . . . I started spinning anyway. And I forgot to buy sock yarn. Oh well. 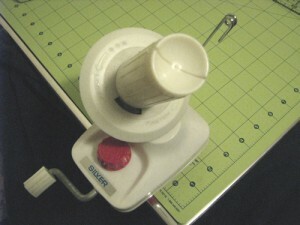 I guess I’ll have to knit what I spin! And yikes. Amy gave me a little demo. I have been spinning all wrong. Of course what I was doing worked on the silk but it did not work on the wool. Well, sort of. I’ve been working hard to do the park-and-draft that she showed me but it’s very difficult. My left hand does not like it at all. I’m not left-handed but I’m pretty ambidextrous. And apparently my left hand likes to be in control! I’ll keep working at it. 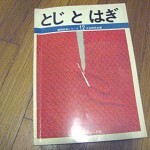 Gettng back to books! Annie mentioned that Amy had a new book coming out so I asked about it and I got to thumb through her advance copy of Spin Control which is due out in June I think she said. It looks wonderful! I’m not very good at following directions especially of other people’s ideas, I generally like to just figure things out on my own, so I can be very particular about what few books I will buy. This looks like a book that would be really useful to me. There are a lot of very specific pictures that are just the sort of details that I find helpful to really understanding and mastering a new skill, as well as the pretty pictures that can be inspirational.